This is arguably the biggest bummer in joggling history. Michal Kapral, the world’s fastest marathon joggler, has been denied permission to joggle in the NYC marathon due to “security concerns”: World Record Holder Denied Permission to Joggle New York City Marathon. This is absurd. 3 small millet-stuffed beanbags are now deemed “security threats” under draconian new rules that ban all props. Michal Kapral was planning on breaking his old world record at the NYC marathon and trained very hard for this event. It saddens me both as a joggler and as a native New Yorker that security concerns would come to this. This isn’t just a setback for Michal Kapral, but a setback for the sport of joggling. Unfortunately, I suspect that there’s more to this than just security concerns. Some people just don’t take joggling seriously, and this may very well include the organizers of the NYC marathon, though they have a long history of supporting our sport. Let’s hope that the organizers of the NYC marathon rethink their decision before November 1st. It would be terrible if other marathons followed NYC’s example. In the mean time, Kapral is looking for another marathon that is more joggler-friendly to break his old record. Get plenty of practice. I usually joggle 6 days a week, which adds up to about 40 to 50 miles of joggling per week. Even on the days I don’t joggle, I practice juggling for at least 20 minutes. While joggling, relax, and always maintain your posture. Take deep breaths. Approach joggling as an active meditation. Keep movements smooth, think of it as a form of dancing, or martial arts. It’s inevitable that people will try to distract you while you’re joggling, but stay focused on what you’re doing. Strength-train your upper body. In order to build endurance in your arms to enable you to juggle for many hours, you will have to strength-train your upper body about once or twice a week. I mean exercises like push-ups, curls, and pull-ups. Doing a little core work like bicycle crunches or planks may help too. I find that just a few minutes is sufficient for improving muscle endurance and circulation in my arms. Occasionally practice juggling(or joggling) with heavy balls. This is almost the same thing as #3, except it combines improving muscle memory with endurance work by targeting the muscles you use for juggling. Juggling with heavy balls for a few minutes is also a great warm up exercise before joggling, since it increases circulation to your arms. When practicing juggling, work your way up to juggling 4, 5 or more balls. Just about all jogglers are 3 ball jogglers, but if you can juggle 4 or more that will help improve your arm speed and hand eye coordination. Once you can go a few minutes without dropping, try occasionally joggling with 4, 5 or more balls. 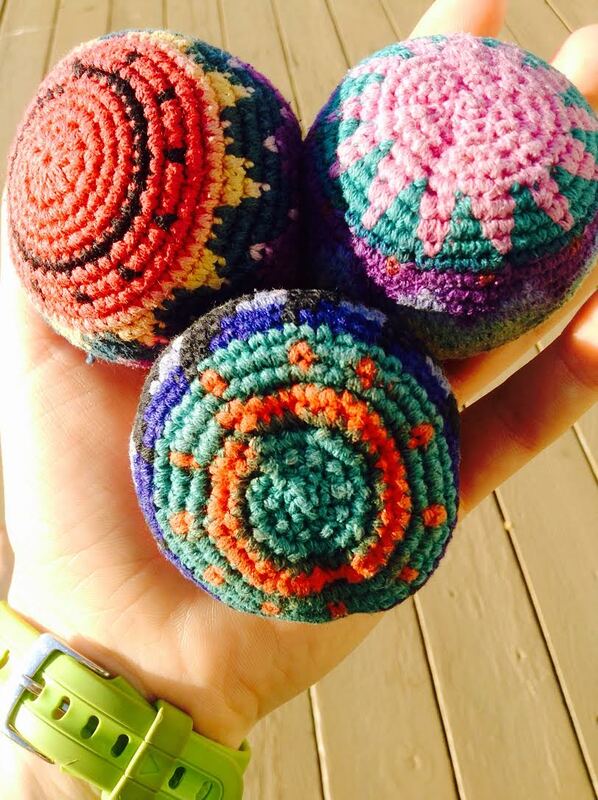 I often practice with 4 balls as part of a routine I like to call “juggle chi”. It’s basically combining juggling with T’ai Chi movements. While training, learn to do lots of tricks while joggling. This will improve your hand-eye coordination and balance. At races, keep tricks to a minimum, if you’re doing them at all, unless you’re really good at them. Joggle with fruit occasionally. This can really challenge and improve your hand-eye coordination to the point that you won’t even feel like you’re joggling when you go back to joggling with regular balls. To take it to the next level, joggle with different types of fruit or fruit of different weight and do tricks with them. Do balance work. When juggling at home, stand on one leg. Better yet, juggle with heavy balls or do lots of tricks while standing on one leg while spinning around. Or combine balance work with strength training by doing planks or other exercises on an exercise(stability) ball. Balance and coordination go hand in hand, since you are more likely to drop if you are off-balance. Hit the trails, especially hilly ones. This is the ultimate joggling challenge since hilly trails can challenge everything all at once. If you can master this, joggling on flat surfaces becomes a piece of cake. Once you become proficient at this, take it to the next level by joggling trails with fruit or heavy balls. 2014 was an epic joggling year for me. Overall, I ran 2,286 miles in 2014, juggling about 95% of the time. So much happened it would be difficult to write about all of it. I improved so much and broke so many personal records my mind has trouble digesting it all. So rather than mention all that happened, I thought it would be better to focus on the highlights of 2014. This is the first vegan event I’ve ever been invited to. This was also the very first WNY Vegfest, and I must say it’s off to a great start. I managed to joggle the Tofurky Trot 5k in slightly more than 20 minutes, and didn’t drop the balls even once. It was priceless being with and meeting so many enthusiastic vegans at this event, celebrating and showcasing the vegan lifestyle. I can still feel all the energy from this event; you really should go this year if you happen to live anywhere close to the planet earth. This was my second time joggling this hilly, historic race, and my third marathon overall. I guess you could say I’ve improved. Not only was I 11 minutes(3:40) faster than in 2013, I didn’t drop the balls even once. Not in my wildest dreams would I have ever thought such a thing was even possible not too long ago. This just goes to show you what you can accomplish with enough dedication. I still feel the Joggler’s High from this event, even though it took place in late September. My crowning achievement of 2014, and the culmination of many years of joggling. This is the farthest distance I’ve ever run or joggled. I only dropped once, and that was at mile 39! If it wasn’t so dark, I probably wouldn’t have dropped. There are moments when I think this was a strange dream. It just seems so close to impossible that there is this surreal quality to it. Yet again, it’s ultimately the product of unrelenting dedication. To live a life without ever attempting the impossible is a life not fully lived. Beyond my tiny little piece of the joggling world, it was a terrific year for the sport of joggling, with new world records set. 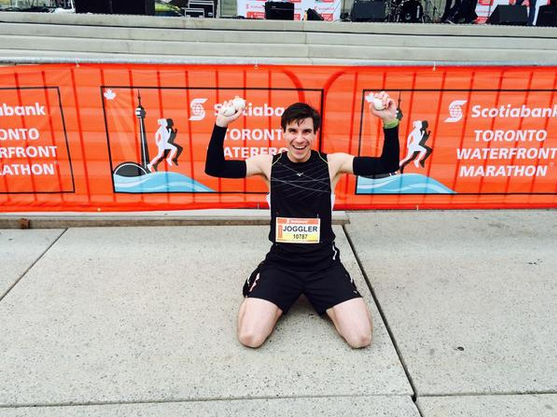 The always amazing Michal Kapral set yet another world joggling record, this time with the half-marathon(1:20:40). He did this as part of a team who are raising money to help AIDS orphans. He also appeared in TV ads for Fairfield Inn and Suites as part of their “Stay Amazing” campaign. Besides this, rising super-star Dana Guglielmo broke the 5k world joggling record in April. I find her story so inspirational because she managed to break a world joggling record while suffering from arthritis. Rather than write my own blog post about joggling and arthritis, I thought it would be much better to let my friend Dana Guglielmo be a guest blogger for this topic, since she has arthritis and is an amazing joggler who holds a world record certified by the Guinness Book of World Records. Without further delay, here is her inspirational story. It was the camaraderie and entertainment that first lured me into the sport of joggling (juggling while running), and when I say entertainment, it’s a two-way street. 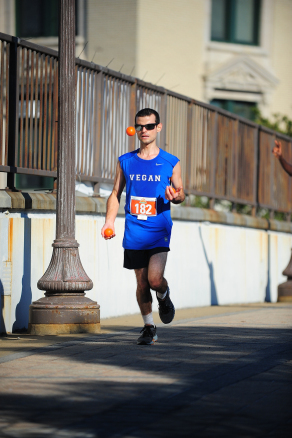 I try to make the people around me laugh with the joggling; in return, the runners and spectators make me laugh with their hilarious comments. 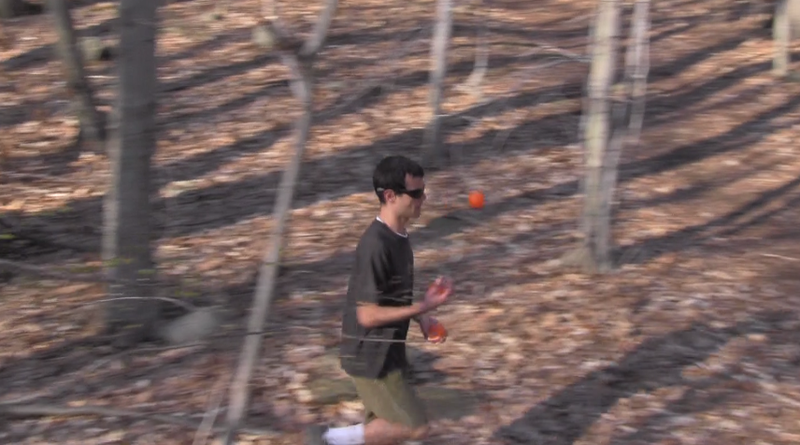 Joggling is basically an open invitation for people to talk to you (and make inappropriate ball jokes). My new hobby has inspired countless laughs, but perhaps the most important gift it brought me was a new approach to battling a chronic condition: Inflammatory arthritis. “You know, Dana, when you run so many miles it makes me wonder what you’re running from,” my friend joked. I was heading out the door for my second run of the day; that week I had run close to 50 miles. I laughed about it, but there was some truth to her statement – I was definitely running from something. I began joggling last year, and as I faced the challenge of running with three hacky sacks spinning in a cascade pattern, I also faced a new challenge in managing my arthritis. Not only did my medications stop working for me, but I began having serious side effects from them. But lowering my medications risked damaging my joints; increasing them risked damaging vital organs. After trying to outrun my arthritis for seven years, I realized my arthritis had outrun me. Gone were the days that I could wake up, pop 8 pills, inject more medication into my stomach and expect to feel amazing on a 15 mile long run. The same medications that enabled me to outrun the disease for seven years had stopped me dead in my tracks. Change was in order. So I stopped trying to outrun my arthritis, and instead, I began learning how to manage it along with being an athlete. I met with a new rheumatologist and dietitian that both fully support my dream of running marathons. Under their guidance, I lowered my medications and altered my diet. As it turns out, the best diet for arthritis patients is the same diet that nearly everyone should follow to be healthy. For the first time in my life, I took it easy. I chilled out. I let go of my need to perfect every little thing. I exercised based on how I felt, and not what my training schedule said. With my new lifestyle and positive mindset, the juggling ball of arthritis became significantly lighter. I stopped running with fear and denial, and began moving forward with confidence. In time, I stopped running from my arthritis. Joggling helped me to manage my health in a way that running never could do on its own. Sure, there will be days that I “drop a ball” and have pain, but you’re allowed to drop a ball – even in an official Guinness World Record attempt! 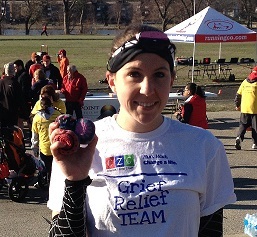 Whether it’s juggling my hacky sacks or juggling arthritis, I hope to be juggling everywhere I go – running included. This was the culmination of many years of joggling. In training, I have covered thousands of miles, injured myself a bunch of times, experienced many setbacks, and connected with many other jogglers and runners. Through it all, my speed and endurance gradually improved, and I was dropping less. I’ve been planning on doing this for some time now, and the perfect opportunity came last weekend. Not only was I fully recovered from the Yonkers Marathon from 2 months ago, but the weather conditions in mid autumn are perfect for going the distance. Besides fine-tuning my training and diet, I also made sure I had all the proper equipment for this adventure. Before setting out on this run, I made sure I had everything I needed in my Black Diamond backpack. 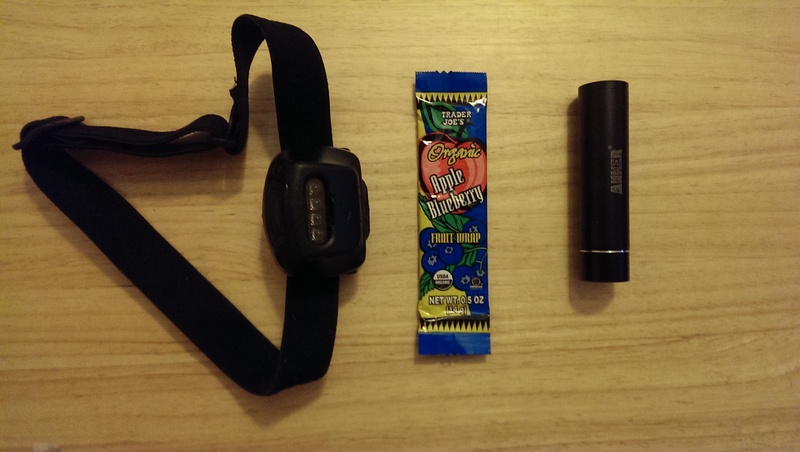 Just a few of the items I brought with me, from left to right: Princeton Tec Tactical Quad LED Headlamp, a bunch of Trader Joe’s apple blueberry fruit wraps, and Anker Astro Mini smart-phone charger. Besides this, I also had 3 Peanut Butter Cliff Bars, a Tofurky sandwich(2 slices between white bread), and later along the trip I bought some water. I realized that with how long this trip was going to be I needed both the headlamp and battery charger, and they both came in handy toward the end. Because of the chill in the air(it was about 40F), I had on a jacket, a t-shirt, a winter hat, and sweat pants. It got chillier the farther north I ran. Preparing for this included the usual long runs, intervals, and hill runs. I tapered for about a week and a half before this. In the weeks leading up to this long run, I was eating a lot more leafy greens than usual, especially arugula and watercress. I also ate vegan kimchi occasionally, since it seems to help prevent digestive issues(too much kimchi or probiotic food could also cause digestive issues if you’re not careful, in my experience). Still, about a week before this run and up till a few days before it, I was feeling increasingly lethargic. I’m not sure why, though it may have been due to over-training. Because of this, I came close to canceling this run, though about 2 days before my energy started to improve. Almost 2 hours after a breakfast of sunflower seeds, bread, and cherries, and shortly after pre-loading with lots of juice, I started my running adventure at 9:36 AM, slowly making my way through Mount Vernon and Bronxville to the Putnam/South County Trail in Yonkers. This paved bike/running path, which I’ve mentioned many times before, used to be a railroad line. About 45 miles long(with a few small gaps here and there), it starts in the Bronx and goes as far north as Brewster, NY in Putnam county. This trailway has a special significance for me since the first time I ever ran 20 miles was on this path. I’ve done numerous long runs on it since. So I started with a slow pace, realizing if I ran too fast I wouldn’t be able to go very far. I did about 9 minute miles for the first 13 miles, which is slightly slower than I usually run. There weren’t that many people out on the trails that day except for the occasional cyclist. 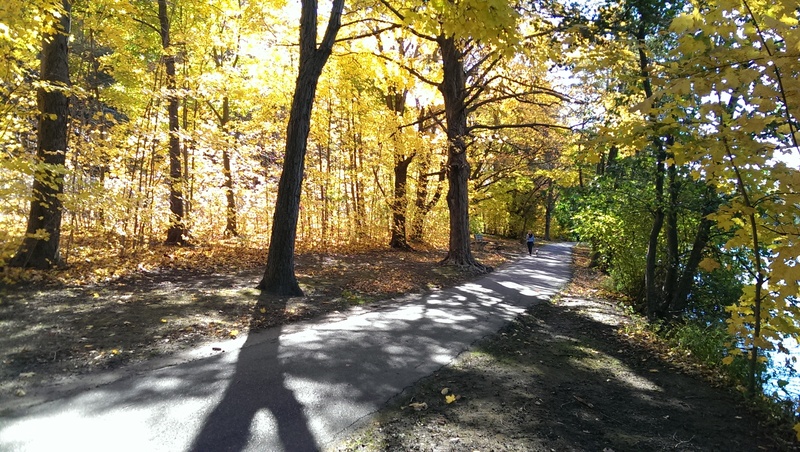 Although it was past peak, there was still a lot of autumn beauty to behold. At about mile 11 in Elmsford, I stopped for a bit to get some apple juice from the store before continuing north. 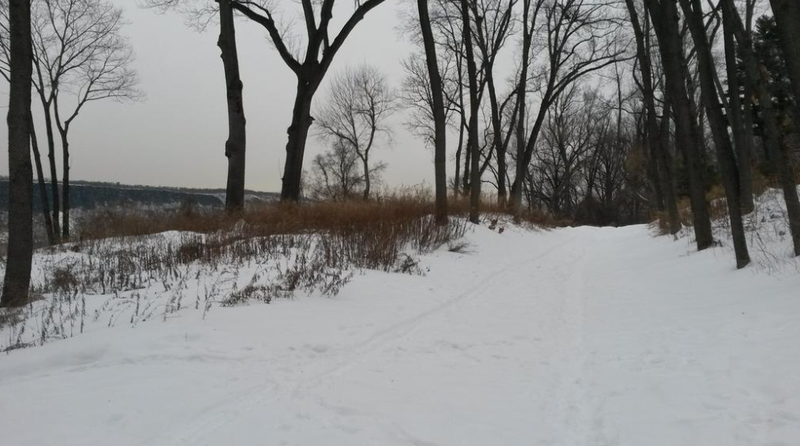 The next part of the trail(after running along the sidewalks of Elmsford, which is where the largest gap in the trail is located) is an upward slope that is often steep. The gentle slope of the trailway from Yonkers to Elmsford does little to prepare you for this. The climb seemingly goes on forever, and could prove frustrating for the uninitiated. I admit I got frustrated occasionally even though I am used to running hills. My tenacity combined with my appreciation for the autumn beauty and sweet, gentle autumn wind helped me get through it. In some areas near Ossining and Briarcliff Manor, the trailway runs alongside some roads, but this mostly doesn’t bother me since there is usually little traffic in these rural areas. After many miles of elevation gain, my legs started to tire a little around mile 20. I kept pushing myself since I knew I was going to take a big break a little after the halfway mark in Millwood. To think that Millwood was once the end point of a very long training run last year, and is now the midpoint! The trail runs very close to a supermarket in Millwood, where I washed up, got some water, and headed back to the trail to eat lunch. I walked fast as I ate a lunch of 2 slices of Tofurky with white bread(I find white bread easier on the digestion than whole grain bread before and during long runs). This is a much smaller lunch than I usually eat because of the serious digestive issues I’ve often experienced on long runs. Even after I finished lunch, I continued to walk to let it digest. All in all, an almost 40 minute break from joggling. I felt so refreshed after lunch that I didn’t have to struggle with my legs like I did before. Though I have run north of Millwood before on the Putnam trail, I always drove my car to get to Millwood to do this. So I am still in familiar territory, and knew what to expect for the next several miles: The tunnel, the hills, and eventually the old bridge that goes over the Croton river. It felt amazing crossing the bridge, since this was the first time I have ever run from the Yonkers portion of the Putnam trail this far north. As afternoon progressed and I joggled northward, it got colder and the sun was getting lower in the sky. I was in very rural, rugged country, heavily forested, and teeming with wildlife, though I didn’t see anything beyond birds and squirrels on this journey. Just a few miles more and I would be going through Yorktown, one of the more historic villages I would pass through on this trek. I didn’t have time to check out the historic churches or other buildings, but the rich history was very much on my mind. As fascinating as all this was, I started feeling sluggish. I quickly got some water from a store and had my first fruit wrap(50 cals). Within minutes, I felt a stomach ache while I was running, but I didn’t let it slow me down. Energy-wise, I felt a little better. Within about 15 minutes, the stomach ache was totally gone, and I continued to push northward toward the Putnam county border. Yorktown is the last town in Westchester county on this route. Before I knew it, I was at mile 30, my old distance record. I kept repeating to my tired self that I only had 10 miles left to go. It was also at this point that I started to notice small snow patches in shaded areas. I had run so far north I was almost in a different climate zone. A little ways north of Yorktown I hit mile 31; it felt exhilarating knowing this was the farthest I have ever run. I also knew that Putnam county was just a few miles away, though there are so signs or distinguishing features along the trail that would indicate this, at least not before I knew I was in the village of Mahopac. 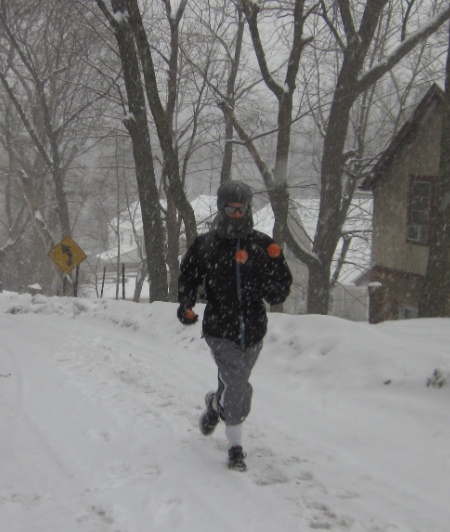 Though this photo was taken a few weeks before the run, this is what it often looked like on the Putnam trail. I was in very unfamiliar territory, both geographically and psychologically. Sure I’ve driven through here, but I have never been on this part of the trail before. The countryside in this area looked like a postcard. The low sun illuminating the red and yellow leaves of the trees looked heavenly. This natural beauty inspired me as the soreness in my legs increased, especially when I had to climb hills. My arms also felt increasingly sore, which seldom happens while joggling. It made sense though since I had never joggled for so long before. After this point I would walk for 5 to 10 seconds every mile. I really believe this helped me make it to the end. Because of how quiet it was and also because I hadn’t seen anyone on or off the trail for miles, I felt like I was the only person on the planet. As a person who loves solitude, this didn’t bother me. Part of the reason it was so quiet was because there were no longer any major roads or highways near the trail, unlike the first 2/3 of this journey. Around this time it started getting a little dark so I put away my sunglasses. Feeling a little more tired by mile 35, I ate another fruit wrap and drank some water. It tasted amazing and gave me a nice jolt of energy to help me push the NYC metro area further behind me. I started to recharge my very low phone battery at this point. I soon realized I was in Putnam county, my first time ever running there. I looked at my map just before crossing the border, just to make sure. 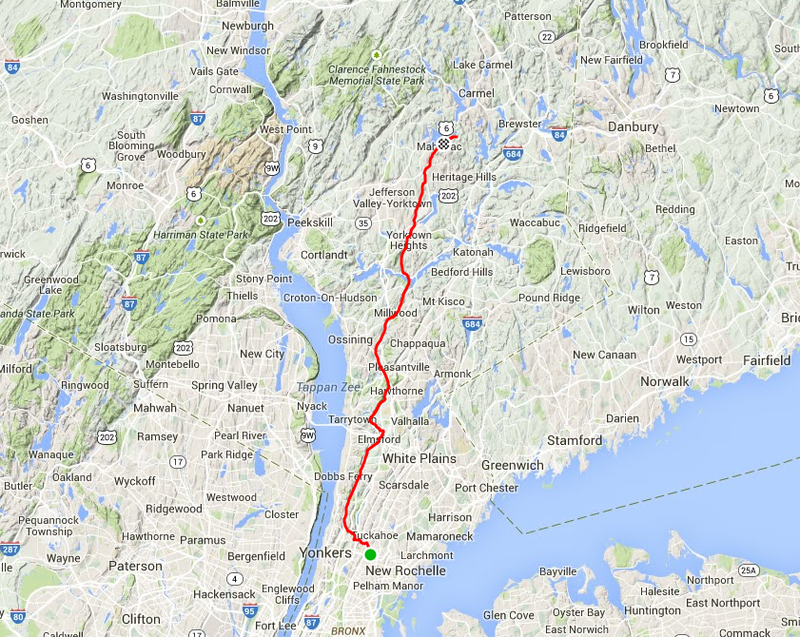 I had run just a little over 35 miles and Mahopac was just 2 miles to the north, but I was excited and feeling strong. Granted, although I was averaging an 11 minute mile pace, which is very slow for me, I felt good. I had to turn on my headlamp a little after mile 36 to see around me. I drank some more water. At mile 37, I was finally in Mahopac! However, since I had planned this to be a 40 mile run, I ran a little eastward toward Croton Falls, and then back to Mahopac. It was at mile 39 that I finally dropped, due to not being able to see that well in the darkness even with the headlamp on. 39 miles without dropping, another new record! I don’t know if this is a world record, but it probably comes close. I finally ended the run at 5:22 PM, when it was very dark and chilly. It took me 7 hours and 46 minutes to complete this at an 11:38 pace, according to Runkeeper. According to Strava, I had been running for 7:06, at an average pace of 10:38(Strava automatically removes the times I wasn’t running). I also managed to climb about 1,290 feet(393 meters) and burned 4,152 calories(and that only counts the running, not the juggling). I did few juggling tricks on this run, mostly in the first half. I had arranged for my cousin to pick me up and also have everything I needed to refuel. Near the end I felt a little bit of nausea but it quickly faded. I had a Cliff Bar and 32 ounces of tart cherry juice. It went down with no major issues. I felt both exhausted and euphoric over this accomplishment. A little bit of nausea returned but it quickly went away. Back at home, I made some miso soup with rice, tofu and vegetables, a perfect meal for replenishing minerals and carbohydrates. I also drank a lot of juice. I had trouble sleeping that night because this run was very over-stimulating, but I felt alright in the morning and did no running that day. It wasn’t so long ago that I would have thought this was impossible. Not just joggling this distance, but running it. Besides having beautiful music playing in my head, I kept repeating to myself that this was just 14 miles more than a marathon. The fresh air and autumn splendor were also a big help, not to mention all the encouragement from friends. I’m hardly the first ultra-joggler. That distinction belongs to Perry Romanowski, whose 50 mile joggling World Record was a big inspiration. I injured myself the last time I tried breaking a distance record, but that was due to not tapering the week before. I still feel terrific almost a week later. I realize I didn’t run the entire time, but this is often the case with ultra-running. I’ll write about my quick recovery in a follow up post. Michal Kapral in Fairfield Inn Ad Campaign! Not only did Michal Kapral recently break a world record in half-marathon joggling, he’s now being featured in the “#stayamazing” campaign by Fairfield Inn and Suites! Way to go! I haven’t seen the ad on TV, but you can easily view it on Youtube(http://www.youtube.com/watch?v=sEX4qufyWCM). I can’t embed videos unfortunately. Too bad I missed the official launch of this campaign, which was just a few days ago here in NY. It’s always great seeing a world class joggler getting the recognition they deserve, especially when they are doing it for a good cause. Joggling may be a fringe sport, but it occasionally does take center stage. I hope Michal Kapral’s achievements and this ad campaign inspires a new generation of jogglers. Congratulations again, Michal! 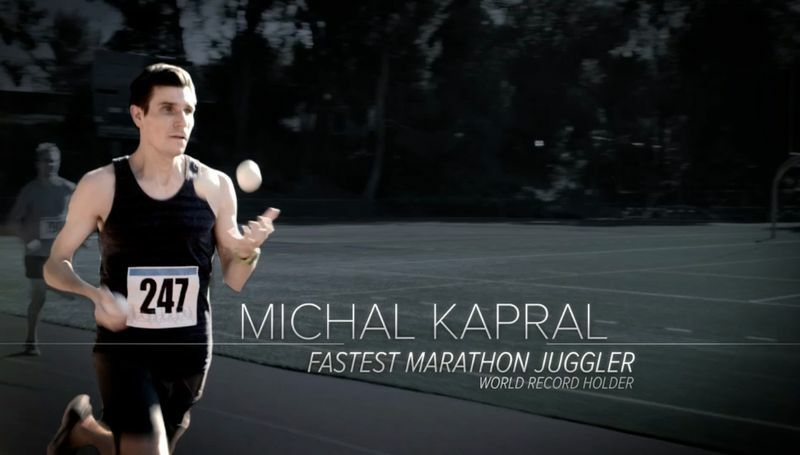 Just as I predicted, Michal Kapral set a new world record for joggling a half marathon in 1 hour 20 minutes and 40 seconds. That’s blazingly fast even for someone who isn’t juggling while running! Congratulations, Michal! It’s great that you’re using your extraordinary talent to help AIDS orphans! Congratulations also to Korir for winning the Toronto Waterfront Marathon! I hope Kapral’s example inspires a whole new generation of jogglers. Our sport usually doesn’t get that much exposure. I believe a lot of the people who say they could never joggle could do it if they trained enough; I know this because I was once one of them.